One of our favourite events on the PGA Tour – it’s the Arnold Palmer Invitational. Established in 1966, this tournament takes place in Florida at the Bay Hill Club and Lodge. It’s a par 72 of course, and is 7,381 yards in length. This was the tournament Tiger Woods dominated for years. He won an incredible 4 straight back when it was known as the Bay Hill Invitational, and has won it a whopping 8 times. Sadly, Tiger is not participating. Last year, the Florida native Matt Every won it – interestingly, his ONLY PGA Tour win to date. 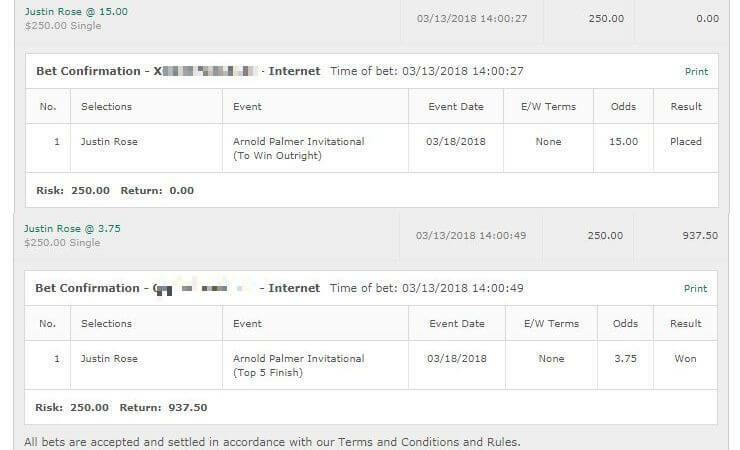 If you want to bet him to repeat you can do so for the price of 175/1. Let’s check out the odds and then see what tips we have! Rory still a big favourite. Very interesting. Keegan Bradley comes into this on the back of two excellent finishes here. He came 2nd last year, and 3rd the year before. He didn’t participate in 2012, but was here in 2011 where he failed to make the cut. Bradley is coming into this on the back of some bad form, but he’s not played in a few weeks and we’re hoping he is rejuvenated, and ready to rock. We’ll probably do a full unit on this one, but a half unit considering the form he is on at the moment would be fine too. Bet: Keegan Bradley E/W at https://www.GTBets.com. 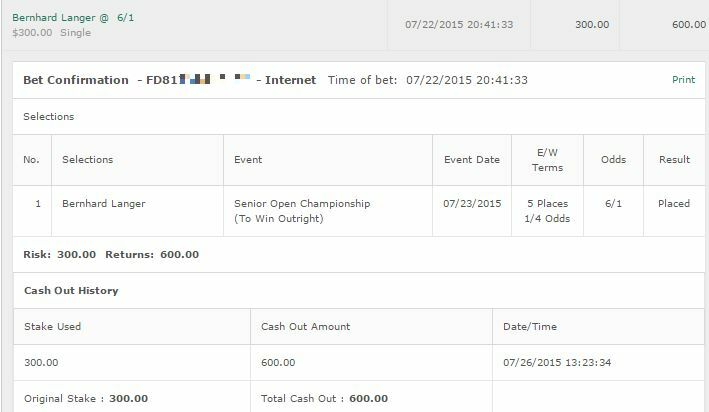 A virgin to this course, Bernd Wiesberger is at 80/1 but is worth considering. He’s been doing just AMAZING in the European Tour. I mean he has 4 freaking top 10 finishes this year. He’s probably the most on form golfer in this tournament. Granted he hasn’t played in a little while so he may be rusty. But he has a few days to sort it out, and we feel it’s worth betting at least a quarter unit on it. Bet: Bernd Wiesberger E/W at https://www.GTBets.com. Na has great potential to crack the top 5 here. This course is made for him – and from what we’ve seen of him lately, he should hopefully come into this one close to top form. He’s played here multiple times before and has mixed results – but two top 5 finishes, and an 11th and 4th place is nothing to sneeze at. 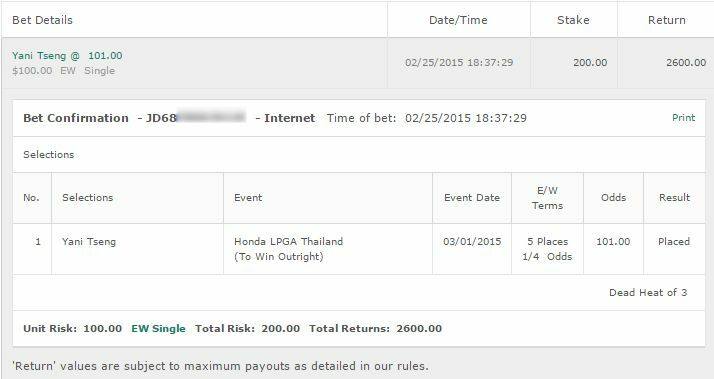 Bet: Half unit on Kevin Na E/W at Bovada for Americans. Wow – major props to Matt Every for that win. 4 spectacular days of golf got him the win. We were insanely unlucky with our pick of Kevin Na. Na shot a 67 on the first day and was leading at the end of day 1. He then shot 70-69-69 which was GREAT – but just not enough. He came 1 stroke short of a top 5 finish. As we said it’s made for him and he put on the solid performance – it just wasn’t enough. Keegan Bradley also looked good up until the last day, where he shot an inexplicable 77. If it wasn’t for that he could also have been in the top 5. So no wins, but so very close and very fun. If you were trading on the betting exchanges you most likely made a good profit.